During my tests with the RPA tool UiPath Studio in conjunction with eCATT it seemed necessary for me to think about an effective way of exchanging data. One of the standard options of interprocess communication (IPC) in Windows environments are Memory Mapped Files (MMF). So I decided to check if it is possible to use them in this context. You can find my first step of this kind of data exchange in my post in the UiPath Community. Here is now the second step where I describe how to use the same approach in eCATT or ABAP. 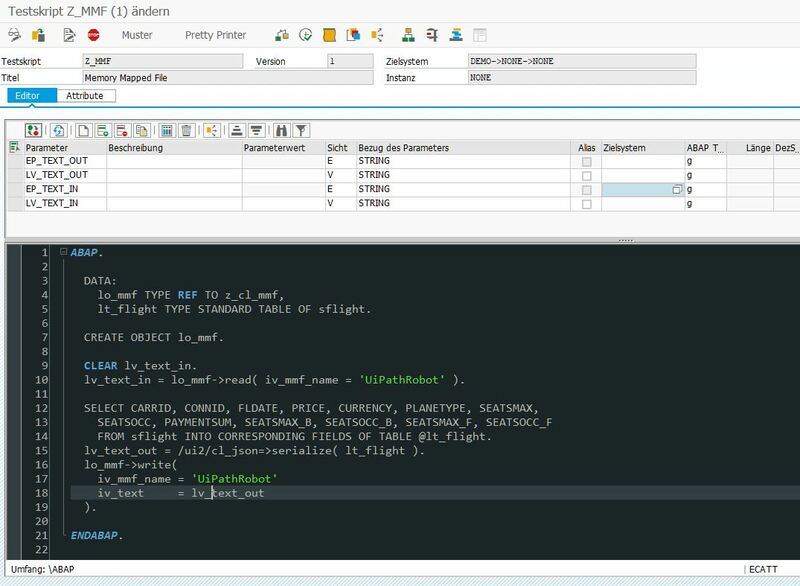 The target of my tests is to get a feeling about the integration possibilities of RPA in SAP environments like eCATT or ABAP. With MMF we can easily transfer data from one process to another and also it is very easy to transfer data of bigger amount. This approach works only in the context of the SAP GUI for Windows, because we need the possibility to use COM. The basics of this approach, how to use Windows PowerShell inside ABAP, I described in my blog here. So far so well, let us start with the PowerShell script. It contains three functions to write, read and append data to MMF. We use only managed dotNET classe like MemoryMappedFile or StreamWriter and StreamReader. Nothing mysterious. 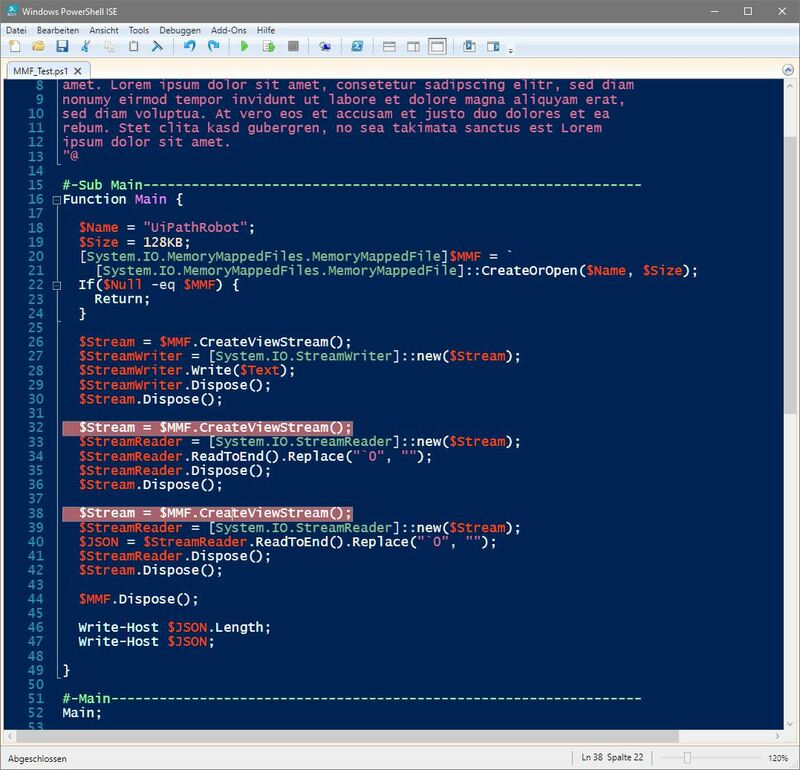 We store this PowerShell script as include development object inside our SAP system. Now let us look to the ABAP class to call this PowerShell functions. It is more or less a wrapper around the PowerShell functions. We have three methods with the same arguments as the PowerShell functions. Also we have a private method to call the function. As you can see contain the methods write, read and append the PowerShell commands and with this command it executes this function from the embedded script. CHECK lo_ps->load_lib( ) = lo_ps->mc_true. CHECK lo_ps->get_is_powershell_installed( ) = lo_ps->mc_true. CHECK lo_ps->init( iv_load_profiles = lo_ps->mc_false ) = 0. REPLACE '#FunctionCall' WITH iv_functioncall INTO lv_pscode. To try this easily we use two executables, one in the context of the frontend and another in the context of the backend. Here now a PowerShell script which initalizes a MMF and store some data in it. And here an ABAP report which reads, writes and appends some data. lt_flight TYPE STANDARD TABLE OF sflight. lv_text = lo_mmf->read( iv_mmf_name = 'UiPathRobot' ). FROM sflight INTO CORRESPONDING FIELDS OF TABLE @lt_flight. lv_text = /ui2/cl_json=>serialize( lt_flight ). We set two breakpoints and execute the PowerShell script. If the PowerShell script stops at the first breakpoint we start the ABAP report with a breakpoint at the select command. Now we execute the PowerShell script til the next breakpoint, execute the ABAP report and also the PowerShell script. Here the expected result. PowerShell gets via MMF the data from the ABAP report and the ABAP report gets the data from the PowerShell script. Excellent, now the last step to transpose this scenario into eCATT. We create a script an set a few parameters. In this example I reduce the script to get and set the data. The protocol of the eCATT script shows exactly what we expected. 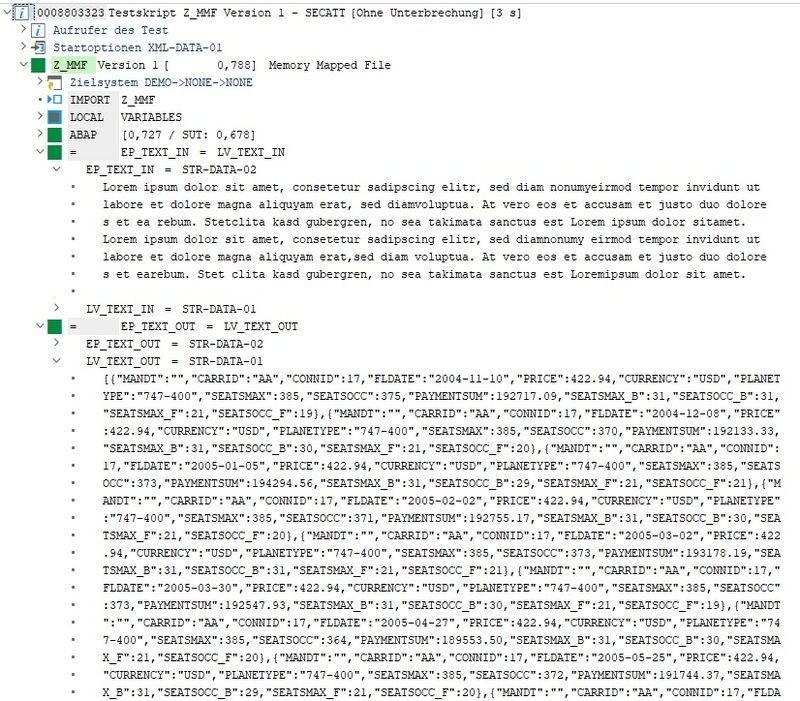 The input data from the PowerShell script and the output data for the PowerShell script. The result in PowerShell is exactly the same as in the image above. Great, all works as expected. 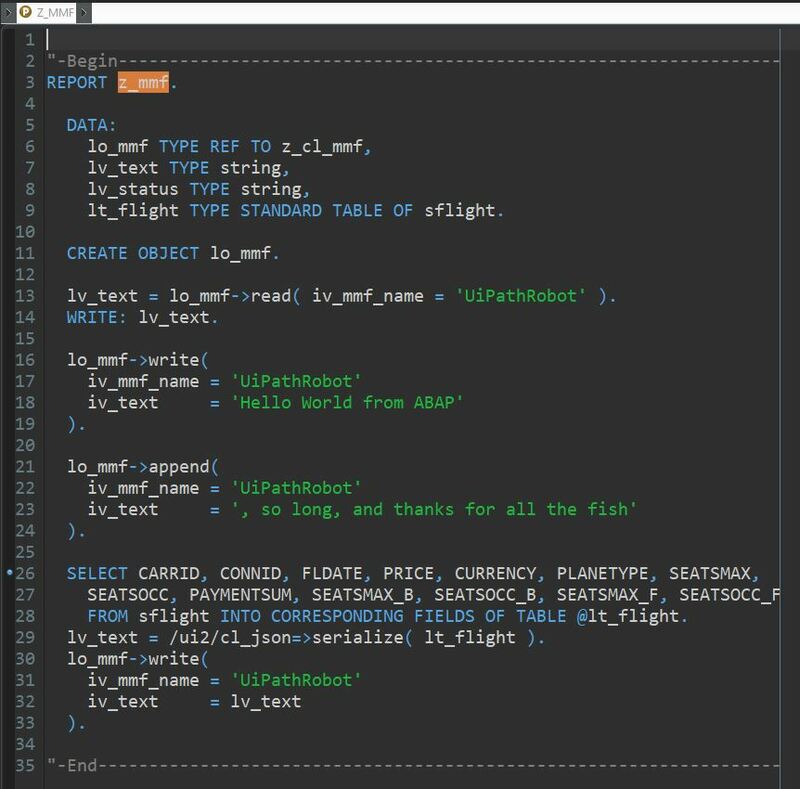 This example shows us how to use PowerShell functions seamlessly in ABAP. Also it shows us how to use MMF for interprocess communications between different processes on the frontend server in combination with the backend server. This process could be a PowerShell script, like in this example, also it could be an RPA process like the UiPath robot. And we can transfer data in larger amount.